In London on the 10th January 1863 the world’s first metro was opened – the Metropolitan Railway. The rapid growth in the population and wealth of the largest city in the world at that time had been achieved by expanding outwards, facilitated by the development of the railways but creating its own huge transport problems. People and goods were crammed onto inadequate roads and congestion threatened to bring London to a halt. The answer was a new railway that would travel underground into inner London. The first section was built between Paddington and Farringdon, but over the next 40 years the Metropolitan Railway extended into East London and to the northwest beyond the boundaries of the city. Led by the ambitious Sir Edward Watkin, the Metropolitan Railway intended to generate income by developing the land along the railway and building housing, extending the urbanisation of London and creating new customers at the same time. This new outer suburbia became known as ‘Metro-land’. 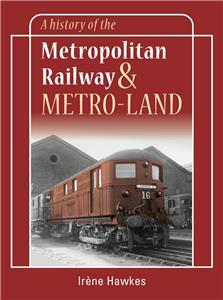 Irene Hawke’s story of the Metropolitan Railway and the development of Metro-land examines how these two ambitious plans were pursued until the railway was first taken into the London Passenger Board in 1933, then nationalised in 1948. The fascinating text is accompanied by contemporary photographs, illustrations, diagrams and advertisements to bring the full story of the rise of the Metropolitan Railway and Metro-land to a wider audience for the first time.